Detailed Description: Pass & Seymour Turnlok® 3-Pole 4-Wire Locking plug in black/white color is made of nylon 6/6 to offer superior impact and corrosion resistance. It has brass blade connector contacts to offer high conductivity. It offers external cord grips for secure and proper cord retention. 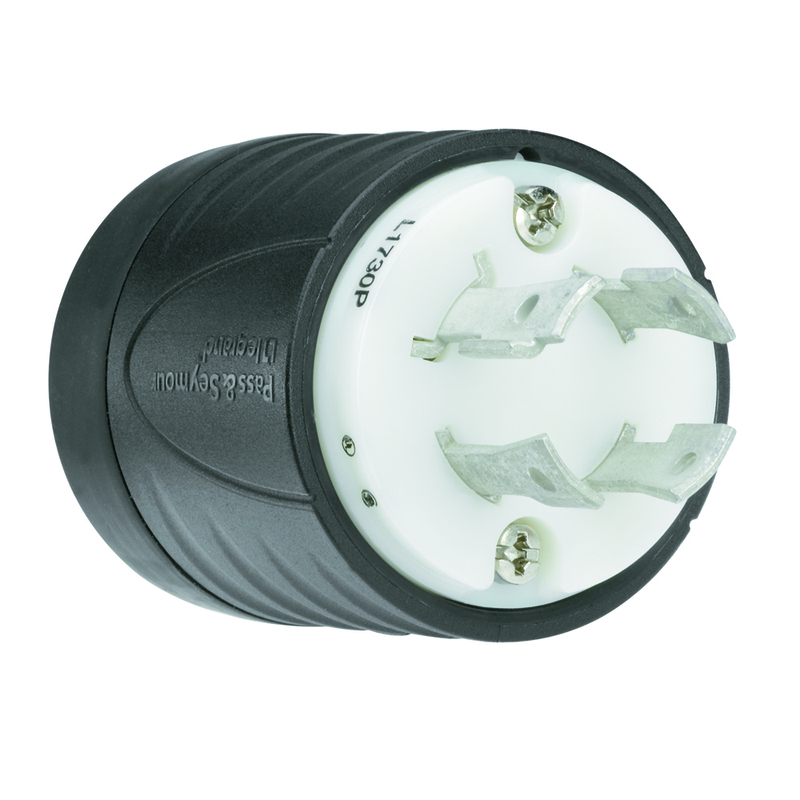 The 3-Phase plug has double dovetail design to offer superior protection against the cord pullout forces. It has raised ribs to offer an additional grip for turning lock/unlock. Plug has rounded back contour to reduce snags and inhibition. Scallop shell design to offer non-slip gripping surface during plug insertion and withdrawal. It has a voltage rating of 600 VAC and a current rating of 30 Amps. Plug has quick-thread assembly screw and cord-grip screw to offer easy installation. It has cord size of 0.385 - 1.15 Inch. Plug measures 2.200 Inch top diameter x 3.750 Inch. It is suitable for industrial applications. Plug has an integral flexible rubber cord that seals around "SO" cord to offer protection from oils/water and chips entering to the wiring chamber. Plug accommodates 18 - 0 AWG wires. It operates at a temperature of -40 to 75 deg C. Plug is UL listed and CSA certified.